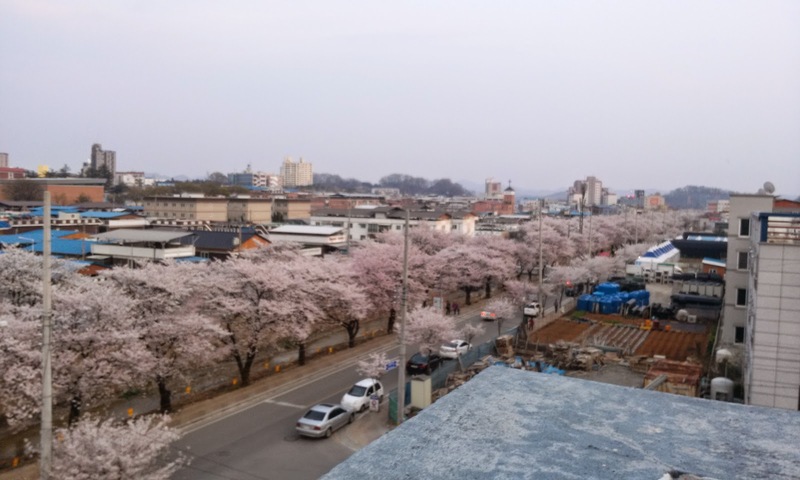 For just about a week every year, the newly warm temperatures at the beginning of spring turn trees across Korea light pink as the cherry blossoms come into bloom. After months of cold weather, life is restored to the landscape and the brown and grey colors that dominated winter are replaced by the colorful palette of spring. I think just about everyone in Korea would choose this time of year as a favorite--it certainly is for me. 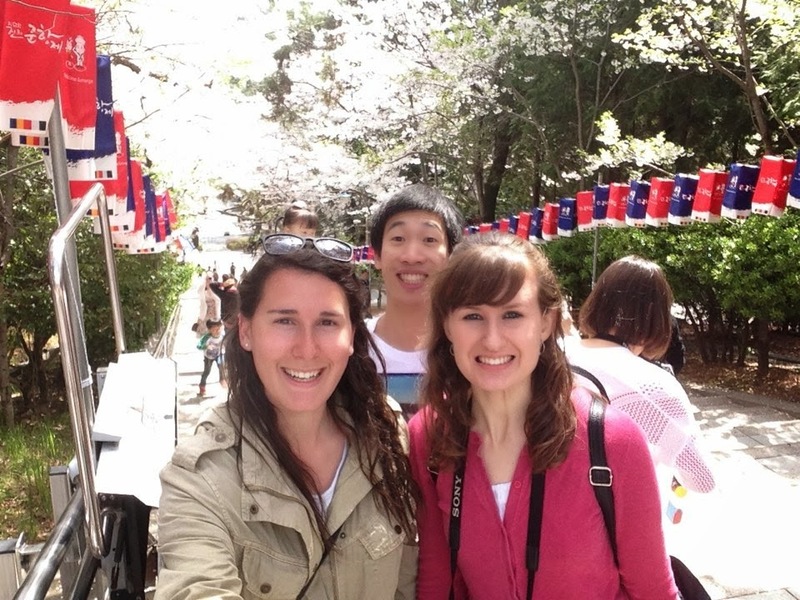 After seeing the cherry blossoms last year, it was one of the things I couldn't wait to experience for a second time. The river right behind my apartment building is lined with tons of cherry blossoms, which means I don't have to look far to get a glimpse of them when they're in bloom. Unfortunately, this river has been under construction nearly the entire time I've been in Korea. While the trees are still beautiful, the river is still an eyesore. Luckily, the cherry blossoms are scattered not only through Jeomchon, but also throughout the entire country. Heading into this year, I knew that when this season came around I wanted to head to Jinhae, the cherry blossom capital of Korea. 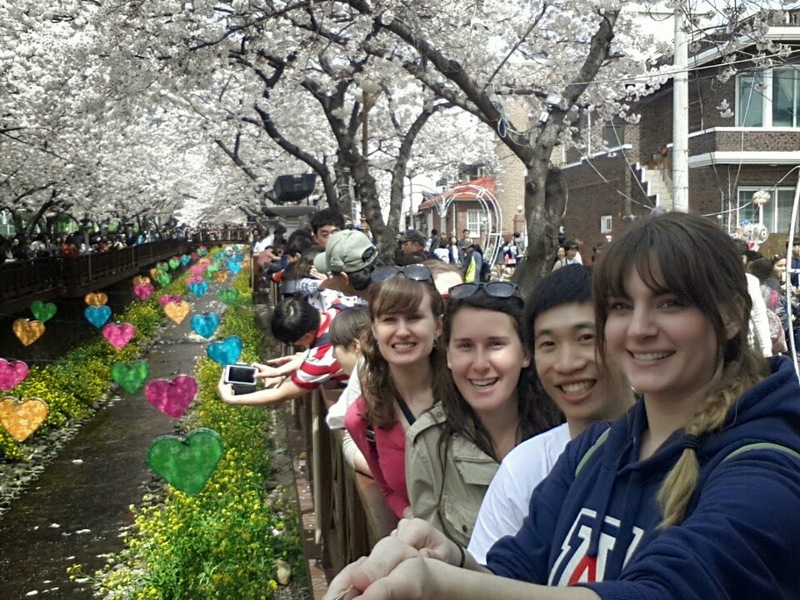 Jinhae is famous for having the largest number of cherry blossoms in Korea (and allegedly the world). 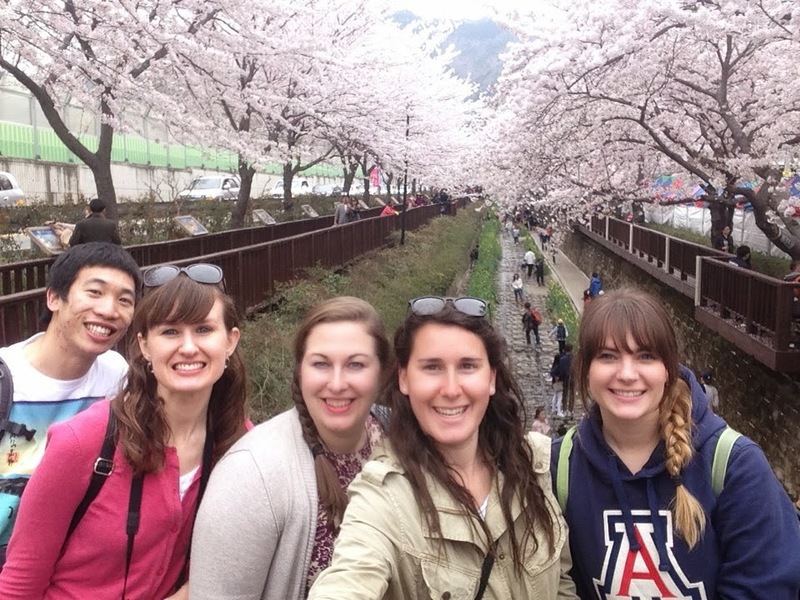 In true Korean fashion, there is a festival to celebrate the arrival of the blossoms each spring, and up to two million people visit Jinhae each year to get a glimpse of this spring treasure. 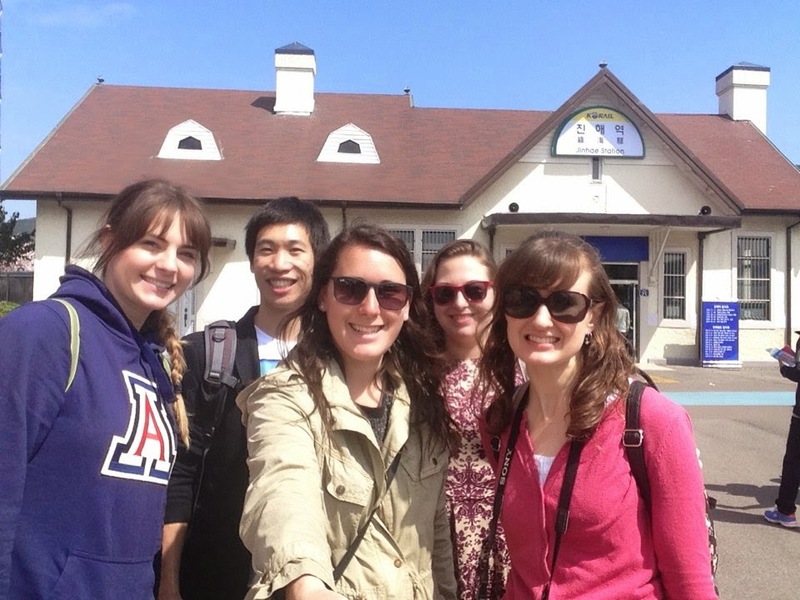 This year a few of my friends from town also wanted to make the trip to Jinhae, and it worked out pretty well that one of our friends even has a car, which meant that we didn't have to take multiple long bus rides to get to the southern part of the country. Instead, we woke up early on Saturday morning and took a road trip directly there. 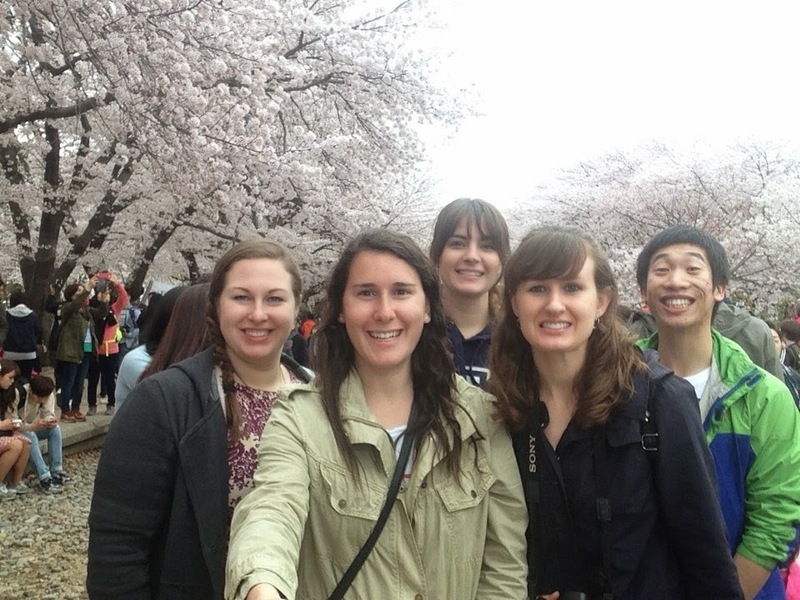 We arrived in Jinhae around 10 AM, and we didn't even have to make it into the center of the city before we started seeing huge cherry blossoms. 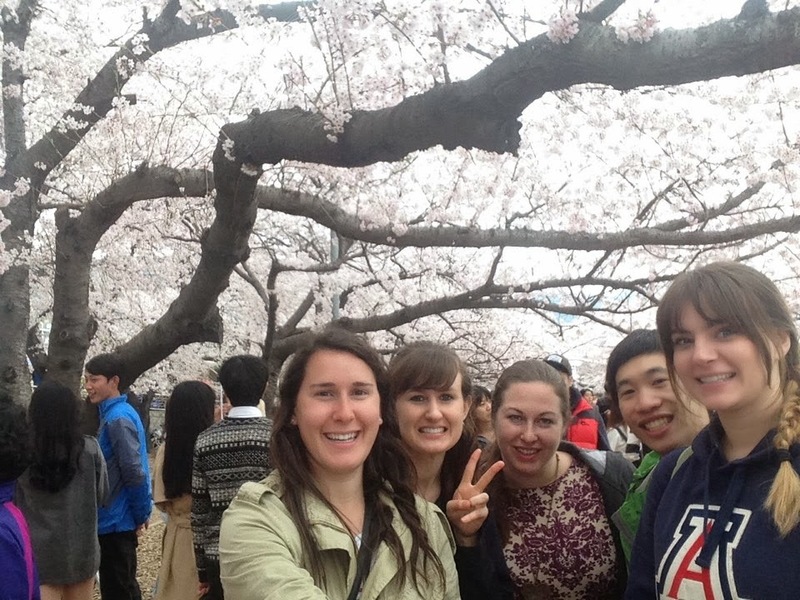 The cherry blossoms lined all of the roads, and unlike many of the trees in Jeomchon, they were HUGE. Once we parked the car, we made out way more towards the center of the festival. 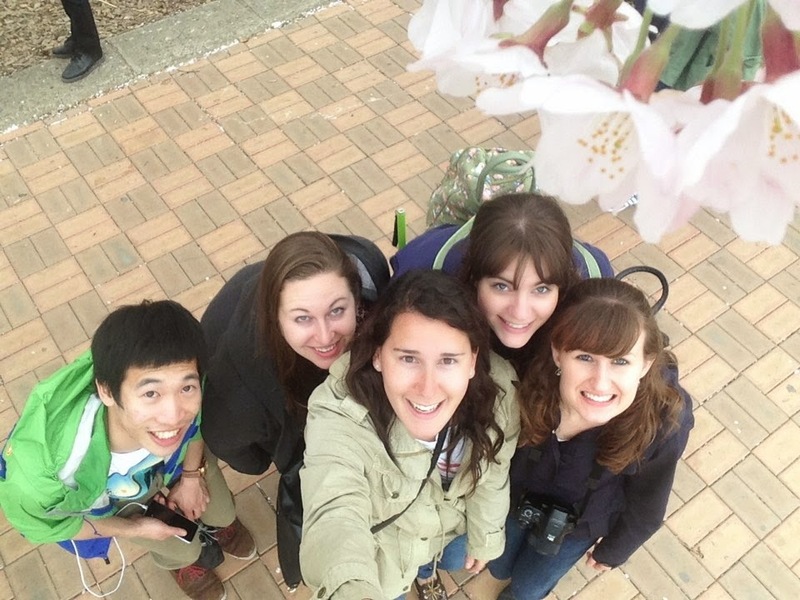 We made it to Jinhae! Our first stop was Jaehwangsan Park, which is located on the top of a huge hill. You have to climb a lot of stairs to get to the top, but naturally the whole way was lined with cherry blossoms, which made it more beautiful. 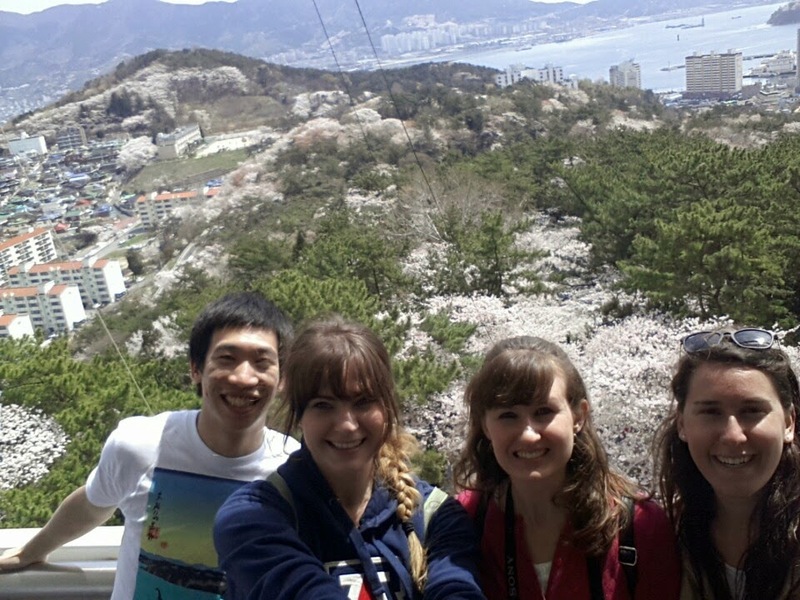 At the top there was a beautiful view of Jinhae, with mountains and a view of the coast. Our next stop was Yoejwa Steam, which is perhaps the most famous spot to view the blossoms. The steam has a board walk, and even though it was filled with people, the sight was absolutely breathtaking. I saw a lot of beautiful pictures of this area before I came to Jinhae, but I never expected it to actually be as beautiful as the pictures I saw online. Much to my surprise, it looked EXACTLY like the pictures, and was in fact even more beautiful in person. Couple outfits. We saw quite a few matching couple outfits during this festival. The train! I was not in a good place to take pictures, unfortunately. We hung around the train tracks for a while and enjoyed the festival foods for a bit before the rain came back again. By that point we felt satisfied with what we saw and decided to head back to the car to make our way home. 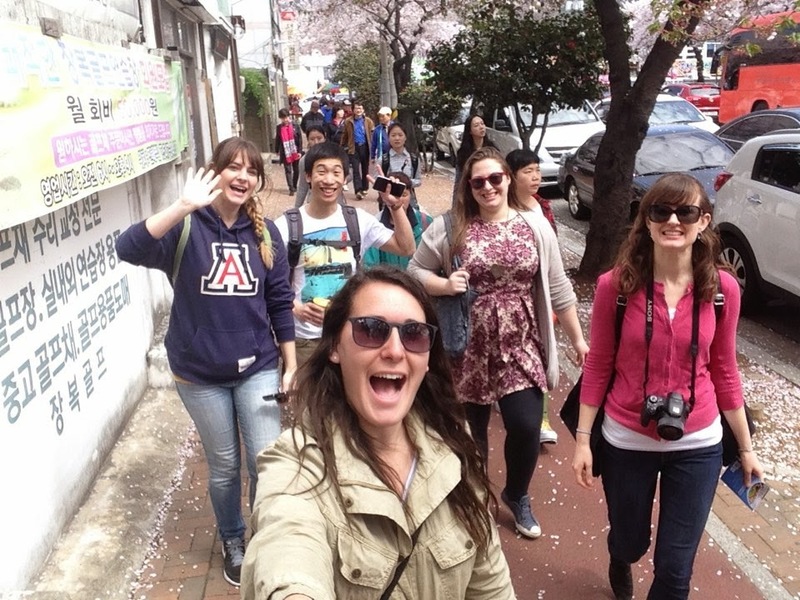 We made a stop in Daegu on the way back for dinner, then finally made out way back home. This festival was one of my favorites I've been to in Korea. Everyone warned me that it was going to be SO crowded that I was afraid I wouldn't really enjoy it. It was in fact crowded, but I didn't find that it made it unenjoyable at all. Maybe I'm just immune to crowds after a year and a half in Korea (and my trip to China), but it didn't really seem much worse than any other festival I've been to. Although I obviously took tons of pictures of the cherry blossoms, no amount of pictures can really capture what it's like to walk under these beautiful trees--the details of the hundreds of beautiful flowers right over your head just cannot be captured in pictures. 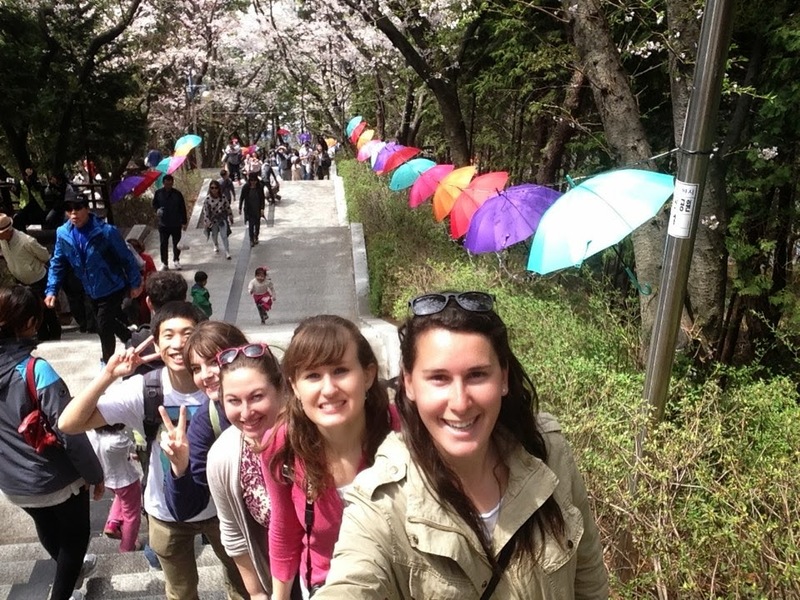 Walking around Jinhae almost didn't feel real--the majority of the time it was like walking under a canopy of flowers. I'm so thankful that I've been able to experience this magically beautiful week in Korea not once, but twice. It's such a unique and awesome start to spring, and something I will definitely miss next year when I'm back in America!